❝ The world’s first floating offshore wind farm began delivering electricity to the Scottish grid last week. 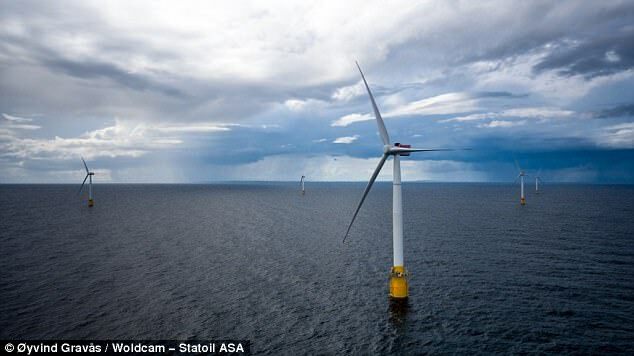 The 30MW installation, situated 25km from Peterhead in Aberdeenshire, Scotland, will demonstrate that offshore wind energy can be harvested in deep waters, miles away from land, where installing giant turbines was once impractical or impossible. At peak capacity, the wind farm will produce enough electricity to power 20,000 Scottish homes. ❝ The installation, called Hywind Scotland, is also interesting because it was built by Statoil, a Norwegian mega-corporation known for offshore oil drilling. Statoil has pursued offshore wind projects in recent years, using the company’s experience building and managing infrastructure in difficult open sea conditions to its advantage. ❝ Hywind Scotland began producing power in September, and on the 18th it started delivering electricity to the Scottish grid. Now, all that’s left is for Statoil and its partner company Masdar to install a 1MWh lithium-ion battery, charmingly called “Batwind,” on shore. Batwind will help the offshore system regulate power delivery and optimize output. ❝ After a number of small demonstration projects, the five 6MW turbines are the first commercial turbines to lack a firm attachment to the seafloor. They’re held in place using three giant suction anchors, which are commonly used in offshore oil drilling. Essentially, an enormous, empty, upside-down “bucket” is placed on the seafloor, and air is sucked out of the bucket, which forces the bucket downward, further into the seafloor sediment. RTFA for greater understanding of why Statoil invested the funds and effort into a technology – that unsurprising – hasn’t a ROI greater than the average pilot plant.